KAB Sonic Domes absorb vibration and keep it away from sensitive equipment like turntables, and CD players. Made from the latest Sorbothane II® viscoelastic polymer, they offer very good cancellation of both lateral and vertical vibrations. Available in 3 hardness densities to ensure the best performance with a wide variety of equipment. A felt top cap is included to prevent the Sonic Dome from sticking to your furniture. With the record needle resting in a stationary groove, turn the volume up a little and tap the body of your turntable on top and then on its side. Many times this test will reveal that the existing feet isolate well in one direction but not the other. 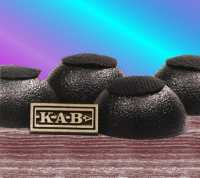 KAB Sonic Domes Isolate vibration well in both planes. Getting the best performance from anti vibration feet means getting a good match between the weight of the equipment and the proper loading , or depressing, of the footer. Little compression or squashing are both improper. Sonic Domes are available in 3 densities so it is easier to get a good match up. The really great features to take note of with the KAB Sonic Domes are the different densities and the great price. The idea that you have to keep piling on one size to meet the weight of your equipment is not very cost effective. Yet most other footer designs require you to do just that. KAB Sonic Domes come in 3 densities one of which will surely fit your requirements. In use, the large flat side of the Sonic Dome is placed against your equipment bottom. The felt topped dome is placed against the support, table top, or whatever your equipment rests on.